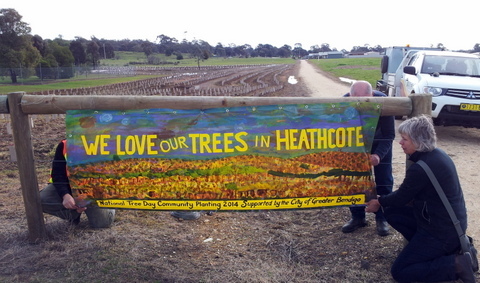 Australia’s largest tree-planting event, National Tree Day-Sunday 27 July 2014, certainly has had an impact on the communities of Axedale and Heathcote as well as the O’Keefe Rail Trail. With the assistance of the Longlea Landcare group, the Axedale community’s involvement on Sunday 27 July will be appreciated in future years. 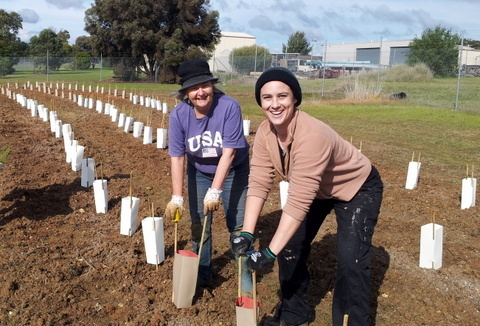 Not only will this day’s planting improved the Campaspe River area in Axedale, it will certainly have an added impact on future O’Keefe Rail Trail users as they enjoy this natural river environment. Heathcote’s former railway station area and surrounds, long denuded of any remnants of natural bushland, is one step closer to being rejuvenating. National Tree Day saw an area adjacent to the former railway station site, and a section of the new O’Keefe Rail Trail, transformed. 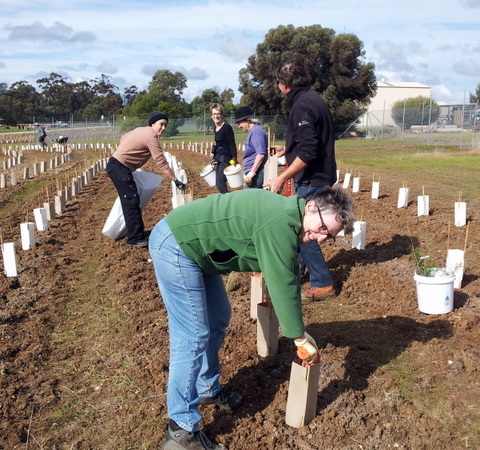 The City of Greater Bendigo Council assisted by the Friends of the Bendigo-Kilmore Rail Trail and the Heathcote Lions Club, aided members of the wider community to plant approximately 4000 different local species in this area. The results of the day’s efforts in Heathcote are impressive, assisting to transform and revegetate this former transport hub area into one for future enjoyment and learning by local children and adults young and old. Could this former Heathcote Railway Station area become a natural parkland with native trees, shrubs and grasses between gravel paths, with elements of the former railway station and trains developed to tell the stories of Heathcote’s former history….could this area become Heathcote’s Railway Park and Heritage Centre? The Bendigo Advertiser’s photographer certainly captured this community day in Heathcote!